Britt-Marie can't stand mess. Her OCD tendencies make her difficult, frustrating and kind of rude. At the age of 63, she leaves her marriage of forty years after she discovers her husband has been having an affair. She has devoted her whole life to her husband and children and now must find work in order to start a new life for herself. She soon finds herself as the caretaker of a run down recreation center in the dying town of Borg. She also becomes the soccer coach to a bunch of misfit kids. Britt-Marie is another grumpy, unlikable character. She offends most the people she interacts with even when she is trying to give compliments. 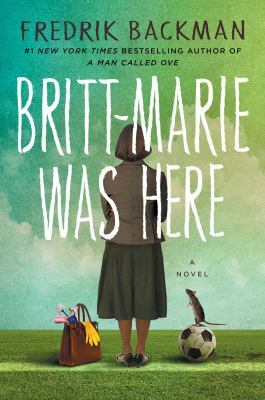 At first I wasn't sure if I would like this book, but by the end I loved Britt-Marie and all the quirky characters she came in contact with. She learns to live again and to find a place for herself. Fredrik Backman is the author of A Man Called Ove and he once again creates a book with endearing characters that will win your heart.